Vanesa is a native and resident of Buenos Aires, Argentina. She is a 35-year-old historian who likes history in general and biographies in particular. Other interests are folk music, folk gastronomy, music, and books about the 18th, 19th, and early 20th centuries worldwide. COMMONERS IN ROYAL HOUSES....CAUSE OR CONSEQUENCE? They are loved and hated, praised and criticized, presented as the sign of a more democratic era or the proof of modern decadence: they are the commoners who marry royals. This article does not tell their personal stories; instead, it analyzes the rarely treated issue of why royal marriages to commoners occur so often nowadays and what could be their possible consequence for the future of the monarchies in which it happens. This issue touches on the future development and ultimate survival of monarchy itself. My view is slightly different: in this article I will focus on the changes that this new development could bring to monarchy as an institution in the very near future. Might these commoners be a danger for this institution? And if they are...exactly why? In which way could they harm the concept and institution of monarchy? The issue of members of royal families marrying commoners arose as a problem when King Edward VIII of the United Kingdom was forced to renounce his dynastic rights to marry the twice divorced American commoner Wallis Simpson. People from all around the world, especially from republican countries, generally supported the couple’s cause in the name of true love. They couldn’t understand why Parliament would deny its approval to the wedding of two persons who loved each other. Edward VIII and Wallis Simpson became a romantic symbol of two lovers who put aside social conventions to be eternally together. For many people, the “anachronistic laws” governing the love relationships of the United Kingdom's royals made no sense. The next generation saw the scandalous saga of the multiple romantic love affairs of Princess Margaret, who first wanted to marry Peter Townsend, a divorced though upper-class man, and then after official disapproval of this relationship, married another commoner, Antony Armstrong-Jones (later created Earl of Snowdon), experiencing a stormy relationship with him that ended in divorce. This episode is an important key to understanding why people began to be favorable to royal-commoner marriages. The idea that “they must marry for they love each other, the same as we commoners do” was the start of a social acceptance that a prince or princess might marry a person without royal blood in their veins. Of course, most historical royal marriages were based on family interest and geopolitical motivations, but there also were love stories. 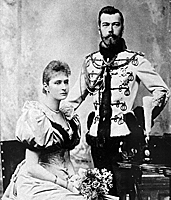 One of the most famous of these was the one of Nicholas and Alexandra, the last Tsar and Tsarina of Russia, but there were others. Love is a feeling and could be waiting in royal hearts as well as in the hearts of ordinary people. Sadly, there is a popular belief that only commoners are able to act sincerely on those feelings. But love is far from being the only reason why a royal would marry a commoner. To fall in love with someone, you must be acquainted with them. Royals in the past were in many ways constrained to interact almost always among themselves. They had royal celebrations, official duties they were required to attend, and political interactions with each other since they really ruled their countries. Their children did not mix with commoners' children. It was somewhat natural that they knew each other better than anyone else, and planned their marriages accordingly - or fell in love as Nicholas and Alexandra did after meeting at the wedding of Alexandra’s sister Elizabeth of Hesse to Russian Grand Duke Sergei. Nowadays, royals have a more "open" schedule: they go to normal public schools, they work outside the royal or imperial palace, and they attend different kind of parties and events with or without commoners. It is not so strange that during the course of these events they might meet and get to know someone with similar tastes and that this person should be a commoner. Other important reasons for this phenomenon could be that royalty and nobility are setting aside the deep feeling of being different from, and superior to, the rest of society. This could be good in the sense that it could end the proud behavior and sentiments of some haughty royals, but it could be dangerous for monarchy because the lack of this feeling could push the royal to think that he or she has nothing specific to do in royal life: in other words, that he or she is no different from a rich industrialist or jet-setting celebrity. Having studied this issue for a while by now, I have reached the conclusion that part of the reason for royals marrying commoners is due to changes occurring within royalty itself. The new generations of royal children have a considerable lack of experience of ancient royal values and ways of life, and this has made them forget what they are and why they are in the highest place in their countries' societies. Most people who declare themselves opposed to such unequal weddings accuse the new commoner wives and husbands of self-indulgence, greed, vulgarity, and other kind of behavior considered unacceptable for royalty only a few years ago. And they could be right. However, they forget the other partner in this situation: the royal husband or wife. Yes, them: these princes and princesses who are born royal. When a young crown prince falls in love with a girl considered to be vulgar, poorly educated, and superficial, and who can’t even dress as we think a royal should do, we are focusing on his tastes in women in general. If he likes a girl with such “qualities,” we should expect that he would share at least some of them with her. Besides, if a crown prince or a crown princess attends places where there are sure to be a good number of “vulgar” and “superficial” people, it may indicate what kind of life partner he or she might choose. So the problem is not just in the commoner but also in the royal. And maybe, even more, in our modern culture. A good example of this issue is the controversial courtship of Crown Prince Haakon of Norway and the commoner Mette-Marit Tjessem Høiby. Even in a country considered “liberal” like Norway, the fact that the country’s future Queen had a rather scandalous and wild youth and was a single mother of a little boy was strongly disliked by the people, and Parliament came very close to forbidding her union with Prince Haakon. But what the people and Parliament were forgetting is where their crown prince had met his future wife: at the Quart Festival in Kristiandsand, the largest rock concert in the whole country. Nowadays (and more so since the Queen of England gave the title of Sir to one of the Beatles) rock is considered to be mainstream music. The international “establishment” accepts and even promotes it. But in fact nobody can deny that rock was born like a rebel movement, strongly opposed to traditional values and aesthetic tastes. Monarchy is supposed to give some protection to these values: monarchy is tradition. Most rock lyrics are fiercely opposed to tradition and classic or folk culture. We may or may not like rock music, but we must also accept that it declares itself enemy to the “family-God-country” trilogy. If a crown prince is found at a concert of this kind of music, he is contradicting what he represents as a member of an ancient family who is the sentimental heart of the nation over which he will reign in the future. A crown prince does not need to be a reactionary, but he must symbolize tradition, at least in some way. If he does not, his role makes no sense at all. He represents the “eternal things” of his nation. This is not to judge rock in itself but the tastes of a Crown Prince and why he married a person who “is not of his world.” The fact is that Mette-Marit is more from his world than a classical, religious, old-fashioned romantic girl, commoner or not. And this is the problem. Another cause of these kind of marriages may be that young royals are now attending public or private universities, often in foreign countries. It’s undeniable that they will meet other students from different backgrounds, and will do so at just the age when young people begin to fall in love. Not having other young royals or aristocrats around, theyoung royal will choose a commoner. Royals nowadays are always among commoners, and even if they see each other time to time for some reason, they seem to find other young royals terribly boring. In the chaotic 1990s, people from Point de Vue magazine (a royalty publication from France) organized summer cruises to try to start romances between royals and failed miserably. They wanted desperately to see Prince Felipe of Spain marrying Tatiana of Lietchtenstein, and they dreamed of a love match between Crown Princess Victoria of Sweden and Willem-Alexander of The Netherlands until they realized that one of these young heirs would have to renounce their future Crown, so they substituted Princess Martha Louise of Norway as an acceptable wife for the Prince of Orange. But the princes themselves appeared to need more “spicy" relationships. The Prince of Asturias married a divorced TV journalist who declared herself a “Republican,” the Swedish Crown Princess is courting a gym trainer and gymnasium owner named Daniel Westling, Prince Willem-Alexander chose an Argentinian economics graduate who worked at the Deutsche Bank in New York and whose father was controversially a member of the Videla government, and the rosy-cheeked Princess Martha Louise changed her colorful romantic dresses to exotic outfits and married a post-modern writer, Ari Behn, whose books are not precisely classic. Princess Martha Louise herself has her own particular ideas about religion, a thing that could be very good in a regular citizen but may be dangerous in a royal, who is supposed to embody the eternal heritage of the nation, a heritage that includes religion. The influx of young royals into the work market could be another reason why so many of them marry commoners. I have already mentioned Prince Willem-Alexander as one of them. They live more as businessmen and businesswomen (almost all of them have studied economics) than as princes and princesses. They have a lot of coworkers, all of them commoners, and they could easily choose their wife or husband from among their colleagues at the company where they work. The romantic symbol of princess and princes from the past has changed to one of the dynamic “guy or gal from next door”- and then they marry a commoner. Not so rare. These modern royals have the same understanding of life as many commoners with successful careers.In fact, it is fair to say that royals are no longer what they were. Their life is the same as that of any average high-class young person. They educate their children in the same schools as rich businessmen of their country or even abroad (their model is the United States society), and they accept post-modern anti-establishment values without any problem. They direct their activity towards supporting charitable institutions and giving speeches about battered women, AIDS, alcoholism, minority issues, or terrorism. The “traditional part” of their work is occupying smaller and smaller segments of their schedules. 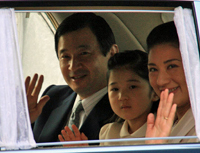 It has even been reported that Crown Princess Masako of Japan has rejected some of her religious duties. She had studied at Harvard and appears not to accept all postulates of Shintoism, the traditional religion of the Imperial House. She has a somewhat Western way of seeing things, particularly cultural issues. Royals nowadays go to rock concerts and many other kinds of contra-cultural events. They do not seem to see themselves as a symbol of their countries' ancestral culture and values, but are becoming like everybody else. They are not opposed to social levelling in the bad sense of the term. They approve it and melt into it. Marrying commoners is one of the causes of that kind of situation, but it is not the only one. In fact, it’s a vicious circle. As already mentioned, princes and princess choose commoners as wives and husbands for they are, in many ways, commoners themselves. Blood doesn’t makes you a royal if you don't accept that you are one and if you are not proud (in the good sense, of course) of your family and national heritage. And of course, there are commoners who take on the mantle of royalty very easily without being born royal. One of the most beloved princess, Princess Grace of Monaco, was a commoner, but she could act even more princely than her husband. Another good example of these kinds of commoners is Shahbanu Farah of Iran, a lady in all senses of the word. For her, duty always came before pleasure, and she (like Princess Grace of Monaco) would always appear in public beautifully dressed, smiling, and performing official duties without repining. Even real royals don’t act in such a way nowadays. Instead, royals by blood and royals by marriage are trying to live as commoners. This is one of the reasons which made innocent little Princess Aiko of Japan say she was very saddened and perplexed that she felt “different from her kindergarten classmates” and she didn’t like it. Evidently nobody could, or maybe even wanted to, explain to her that truly she was different and much less why.